I know, I know. Juvenile title. I can’t help it. So it’s time for the wedges. By the way, I followed Ian Kirby’s technique as described in Woodworkers Journal (October 2007) and in a bit less detail on this website. First, to cut the kerfs in the tenon. 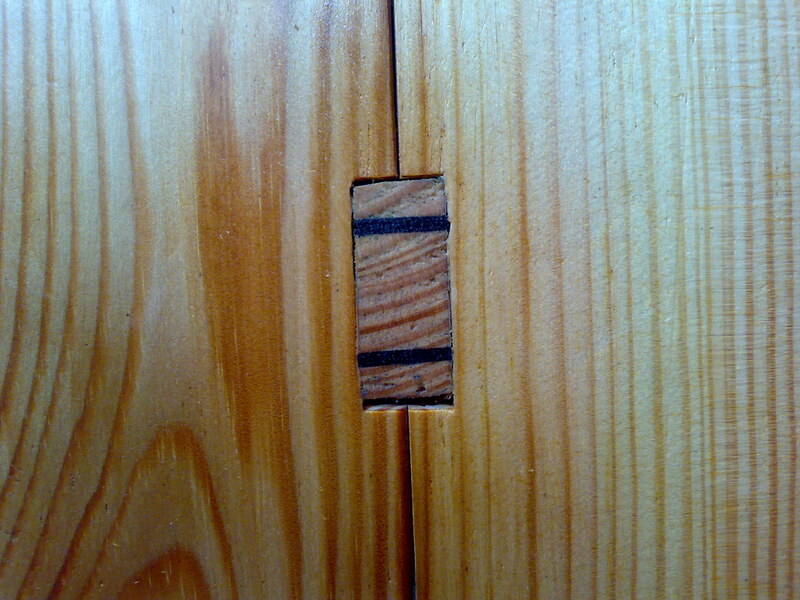 Kerfs should be less than 1/4″ from the edge of the tenon, and should stop about 1/8″ from the shoulder. Likewise, when you open the mortise so it angles out, the opening should begin 1/8″ in from the inside of the mortise, to better support the angled tenon. Next, to cut the wedges. 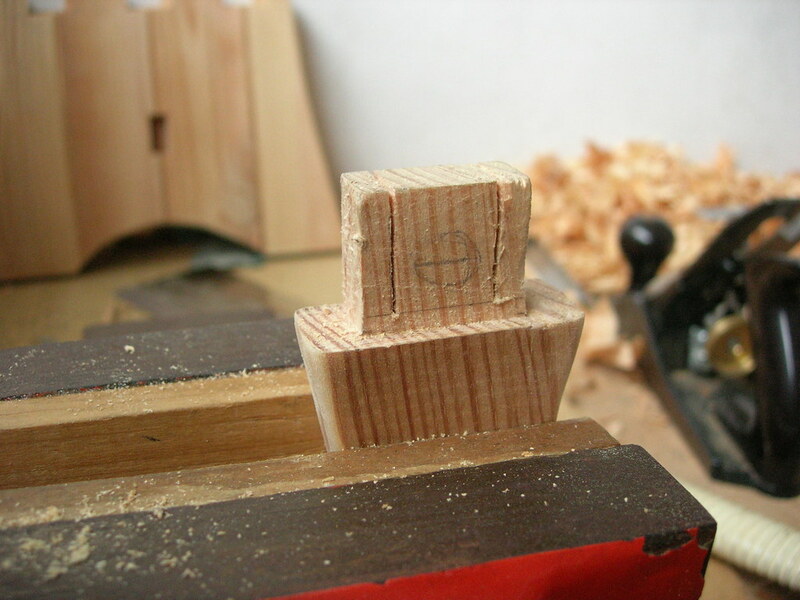 Wedges should be the same width as the tenon, and the length should be that of the kerf you just cut, plus 1/3. The gradient of the wedge should be 1:8. If you’ve got a sweet ryoba like mine, these tiny wedges aren’t hard at all to cut. 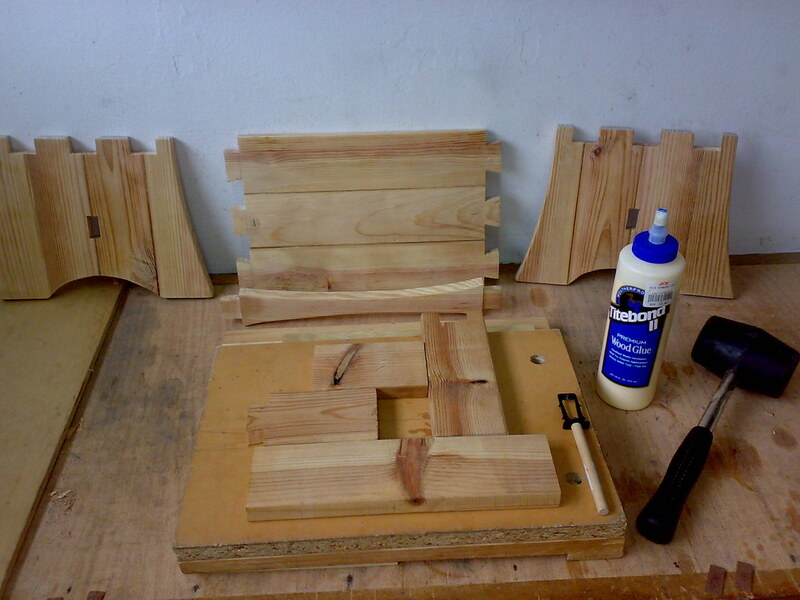 By the way, in keeping with the spirit of the contest in which I’ll be entering this piece (One Man’s Junk), the wedges were cut from this block of wood which used to be a supporting rail for a drawer on my “bench” (really just some cabinets). Dug it out of the scrap heap for this project. Now I’m ready for the glueup. As always, I did a dress rehearsal first. Good thing, too – I realized that when I wanted to set the stool on end to hammer in the wedges, I needed a well to house the tenon on the opposite side, which was about 1/2″ proud of the side. Thus my little setup there. Glueup accomplished, though not quite as quickly as I would have liked. For the wedges, I applied glue on each side, pushed them in as far as I could with my fingers (not very), and then tapped them in with a hammer, using light taps at first and alternating between the wedges. When the wedges are all the way in, the striking sound changes to that of hitting solid wood. After several hours, I went back into the shop to trim the wedges. 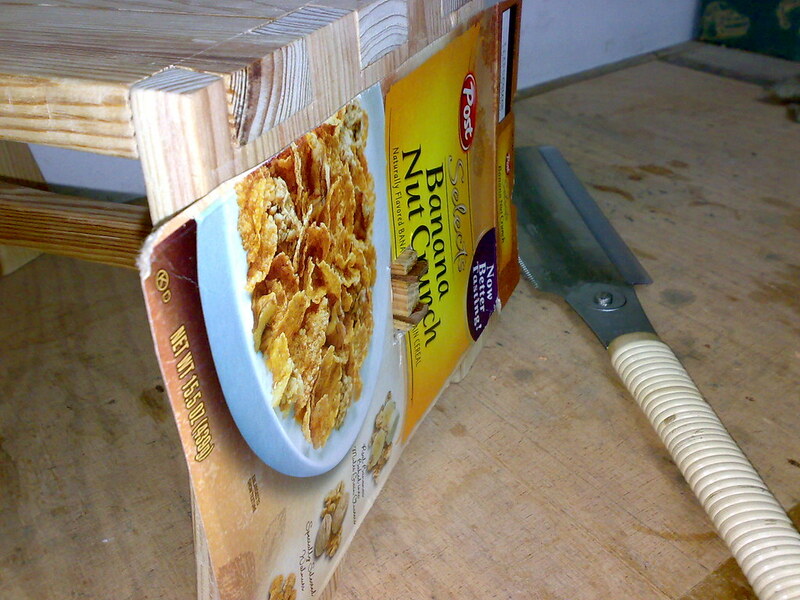 After my last experience trying to flush cut with my ryoba (where I kept grazing the project with the saw), I used this cereal box to protect the piece as I cut the excess off the tenon. The thin material helped me get pretty close to flush. 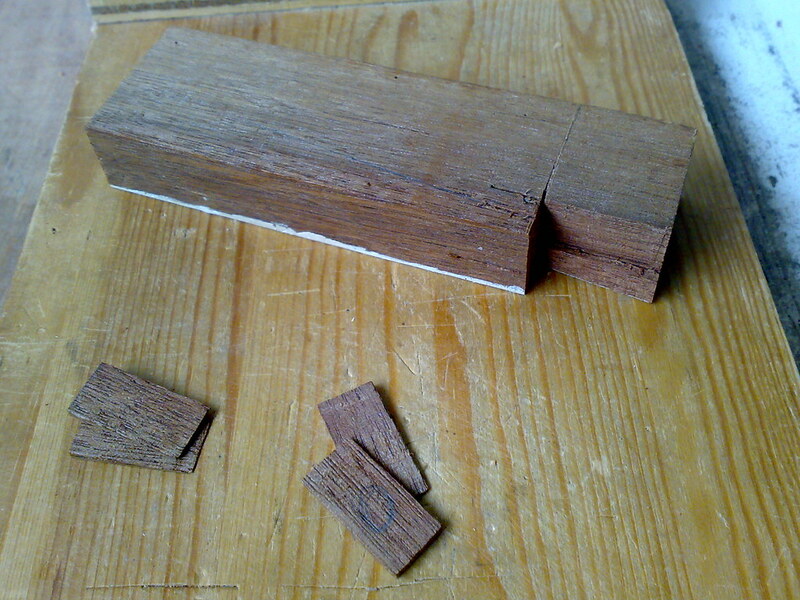 I then followed up with my chisel, paring carefully while keeping the back of the chisel flat against the wood. And there we go! You can see in the following picture that I opened the mortise a bit unevenly, the bottom showing more of a gap; at least I did it the exact same amount on both sides so it’s uniformly off. I can live with that. 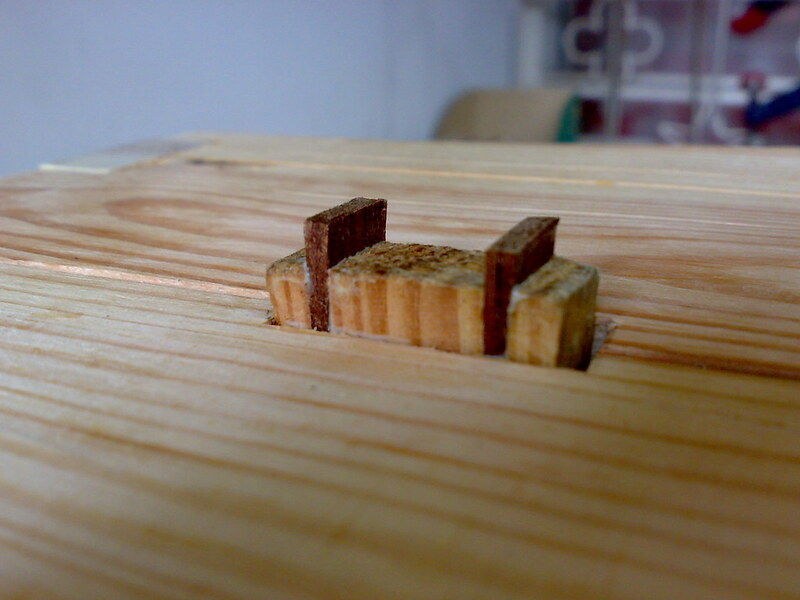 Ian Kirby’s wedged tenons show the same amount of gap in every single one, and I actually liked the gap and tried to do it. He never does say in his article how much to open the mortise, only to open it “a given amount.” Thanks dude. Very helpful. So that’s it! I’ve since done my final sanding and have applied my first coat of finish (oil/varnish/spirits). I’ll do another coat or two of that before finishing up with a couple coats of just varnish. And then I’ll post it in my projects section!